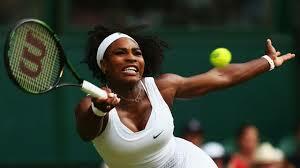 World number one Serena Williams picked up her sixth title in Wimbeldon Tennis Championship. The 33-year-old American won 6-4 6-4 on Centre Court to claim her 21st Grand Slam title and third of 2015. Williams withstood a late fightback from 20th seed Muguruza to come through in one hour and 23 minutes. She will head to the US Open next month aiming to complete the first calendar year Grand Slam of her career. In the Men's finals.. Defending champion Novak Djokovic will face the second-seeded Rozer Federer in the title clash in London today. Federer will become the first man to win eight Wimbledon titles if he wins today's final. Currently Federer shares the record of seven wins with Pete Sampras.